Every so often I come across notices such as this featuring the Irish Harp at the top of the page. Unfortunately I know nothing about the Children’s Liberation Parliament. It should be noted that there is a Fr. 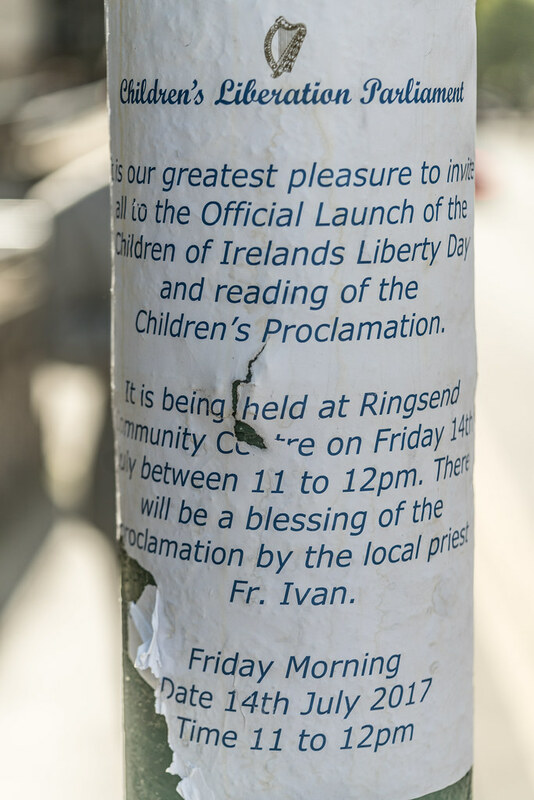 Ivan based at the nearby St. Patrick’s church and he is the parish priest. The Children's Rights Movement is a historical and modern movement committed to the acknowledgment, expansion, and/or regression of the rights of children around the world. It begun in the early part of the last century and has been an effort by government organizations, advocacy groups, academics, lawyers, lawmakers, and judges to construct a system of laws and policies that enhance and protect the lives of children. While the historical definition of child has varied, the United Nations Convention on the Rights of the Child asserts that "A child is any human being below the age of eighteen years, unless under the law applicable to the child, majority is attained earlier. "There are no definitions of other terms used to describe young people such as "adolescents", "teenagers" or "youth" in international law.